as a wedding gift...in 1999! You know from my menu this week, that I am trying out a crock pot cookbook and that I am taking part in a crock pot cooking class. I thought we would make it a crock pot hat trick and talk about how perfectly practical slow cookers are. First of all, if you don't have a crock pot, I am surprised. Secondly, you can pick one up at garage sales for next to nothing (or from a relative who has theirs shoved in a box in the garage for free) or at CVS around the holidays for $19.99 and then get $10 ECBs back. Whatever the case, your initial investment is negligible. Money - The costs of running a 195-235 wattage crock pot with East Texas' 2010 energy rates run from about $.13 for running it 8 hours on low ($.015 /hr) to $.08 for running it 4 hours on high ($.02/hr). Comparatively, to run the average electric oven the energy cost will run roughly $.17/hr (when cooking for an hour at 350F.) If you used your crock pot once a week instead of your oven you would save around $2.08 in energy costs. Since everything is in one dish, there is less clean up and consequently, less water and detergent used and more savings. 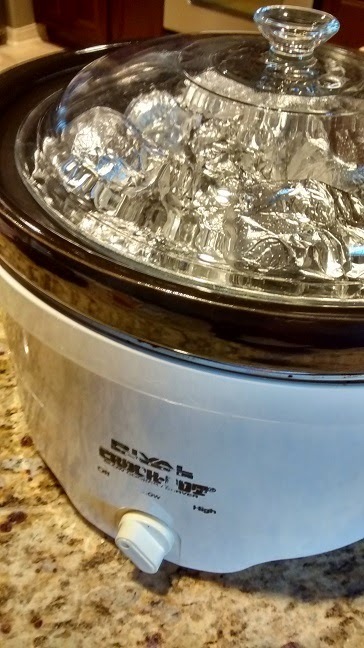 In the summertime, crock pots are wonderful because they don't heat up the whole kitchen - which means the air conditioner doesn't have to work so hard - which in turn means your energy usage doesn't spike at dinner time. 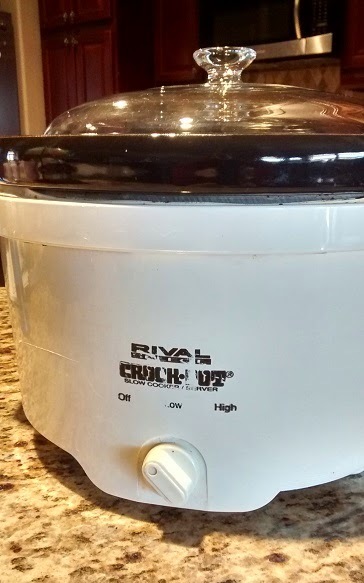 You've heard the term "low and slow" well that's where the good ol' crock pot shines. You can add further savings to your grocery bill by buying cheaper cuts of meat. Since the slow method of cooking breaks down all of those fibers that make cheaper cuts of meat tough when cooking faster, you get really flavorful meat that melts in your mouth for not much moola. Time - That is not inclusive of the time it takes to prepare several dishes for supper instead of a one pot wonder. Time savings should most definitely not be overlooked. Use your crock pot in conjunction with your freezer cooking day. You can cook large amounts of meat without tying up your oven. Then stuff that meat (along with the rest of a meal's fixings) into freezer bags and away you go; other nights' meals sorted. Then when you want to use it you just put the whole thing frozen in the crock and leave it all day. Health - Cooking in a crock pot is often healthier than other methods since you don't use much (if any) of a fat source and vegetables retain more of their nutrients by cooking them slowly. Sanity should not be overlooked either. Fifteen to twenty minutes of prep in the morning sure does take a whole lot of pressure off in the evening when you have to ferry children to various lessons and practices or help with homework and the like. Plus, there is the added bonus of that wonderful comforting smell of dinner already made when you walk in the door. Did you know that you could bake bread in the crock pot? Well you can and it is a whole lot less energy usage than a bread machine. Did you know that for every time you peek and lift the lid you have to add 20 minutes of extra cooking time? So the moral of that story is DON'T LIFT THE LID! If you used your crock pot for your family once a week in lieu of going out to eat you would save somewhere around $35 - $40 a week. That's a savings of $1820 - $2080 a year! Wash potatoes. Cut off any bad spots and pierce once or twice. Sprinkle with salt (or Lawry's Seasoning Salt) and leave on high for 1-2 hours or low for 3-4 hours. This is part of WFMW and FPT. bread in a crockpot? can you post that one please? or provide a link. thanks! I have made the pre-seasoned fajita (spell?) meat from Kroger in the crock-pot and added potatoes and carrots. Turned out super yummy. I have seen them on price reduced for as little as $3. The Kroger pre-seasoned chicken fajita meat is very yummy. No telling how many preservatives and stuff are in there to make it taste so good. :) They are often part of the meal deal too. I would put maybe 1/2 cup of water with the frozen meat and cook it on low for about 6 hours or until done. Our oven gave up the ghost 2 weeks ago, so I'm using the crockpot more than ever. I love the idea of getting dinner going in the morning so I don't have to stand in front of the open freezer door 'round about 3 o'clock and wonder what we're going to have for supper. Thanks for coming by and introducing yourself this week! I'm so sorry about your oven but the bright side is that you've discovered how much you like your crock pot. :) Thanks for stopping by! What great information and a great recipe. Hope you had a great Valentine weekend and thanks so much for sharing your awesome post with Full Plate Thursday. What a great idea Ms. Jennifer!